I had finished my Bioderma micellar water and was desperate to find another makeup remover as I was hell bored. It took forever to empty that bottle. Also, my Garnier micellar water was still on the way (from amazon.in), hence instead of buying a new one, I grabbed a makeup remover from my sister. 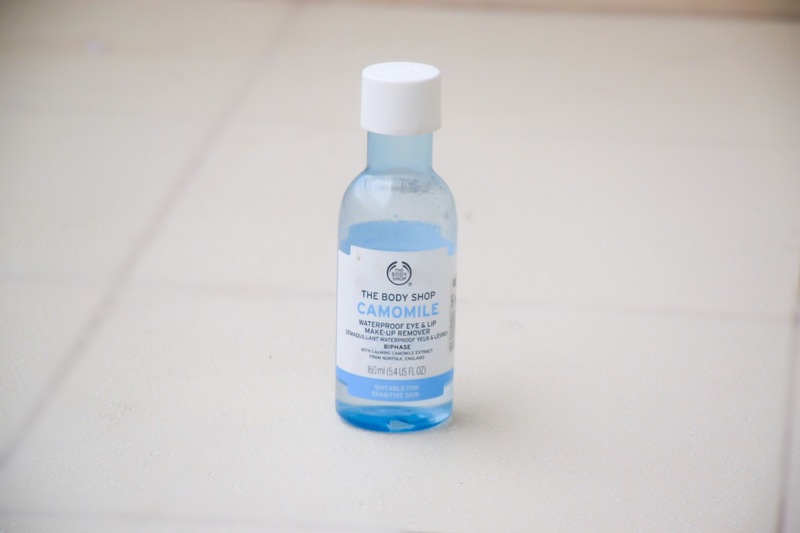 It’s The Body Shop Camomile waterproof Eye & Lip makeup remover. I am about to finish this as well. Keep reading to find out my views on this. Price: It is priced at Rs.895 for 160ml and has a shelf life of 36 months. 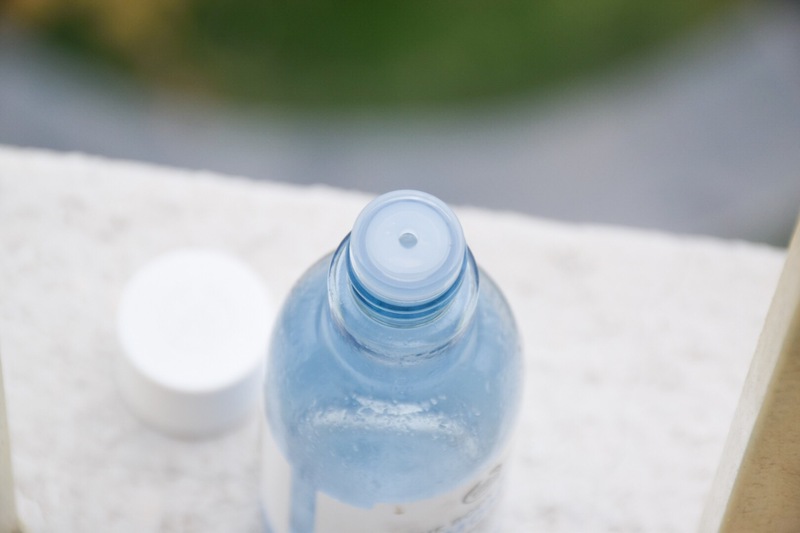 Packaging: It comes in a blue transparent bottle with white cap. It has a small opening which controls the amount of product dispensed. Ingredients*: Aqua/Water (Solvent/Diluent), Isododecane (Solvent), Isopropyl Palmitate (Emollient), Potassium Phosphate (pH Adjuster), Hexylene Glycol (Humectant), Sodium Chloride (Viscosity Modifier), Dipotassium Phosphate (pH Adjuster), Trisodium Ethylenediamine Disuccinate (Chelating Agent), Decyl Glucoside (Surfactant), Polyaminopropyl Biguanide (Preservative), Disodium EDTA (Chelating Agent), Arginine (Skin Conditioning Agent), Taurine (Fragrance Ingredient), Anthemis Nobilis Flower Extract (Natural Additive). The key ingredient which is marketed is Camomile. It has been proven to be highly effective for soothing sensitive skin with its anti-irritant properties. This wonder flower is suitable for all skin types. However, it is the very first last ingredient in the ingredient list. Sad enough? Also, the ingredient I would really worry about is Isopropyl Palmitate. It has comedogenic rating of 4, hence should concern people with acne prone skin. Also, it is the very third item in the ingredient list, meaning it is present in higher amount. Efficacy: I never used it for the face because of the disturbing ingredient Isopropyl Palmitate. (Had Nykaa displayed the ingredient list, I wouldn’t let my sister purchase this in the first place!) Also, I thought this was meant for just eyes & lips, as the name suggests too. This indeed removes all kinds of waterproof liners and lipsticks in 2-3 swipes. It didnot irritate my lips but it did sting my eyes, a bit, sometimes. 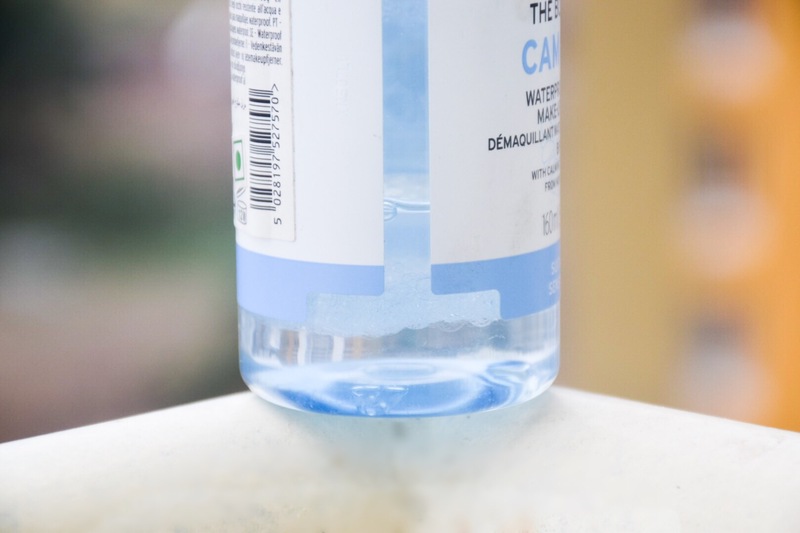 This biphase makeup remover needs to be shaken well before using. It converts into a mild foamy water once shaken and because of the presence of oils, it removes waterproof makeup as well. It does sting but nothing over the top. I have used this comfortably to remove my waterproof mascara and liner as well. Summing up the cons: Stings sometimes, has highly comedogenic ingredient & the main ingredient Camomile which is even on the label in bold is present in the ingredient list in the end! Hence wouldn’t recommend this for face, slightly expensive for makeup removers present in the market. I will not be repurchasing this as I am looking for options with good ingredients. 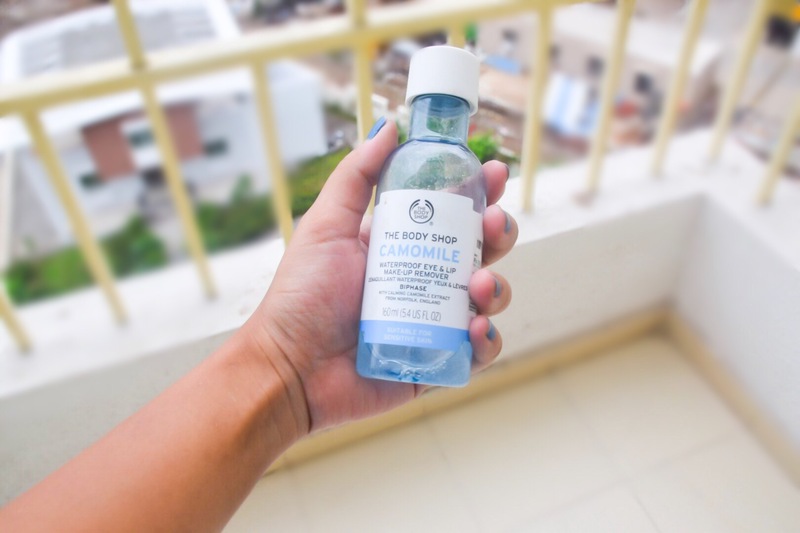 Also, I am using Garnier micellar water at present, let me know if you want a review on it. Lovely & honest review. I always use oils for removing my makeup. Do try olive oil. Love that eye soothing blue color and you have click the pictures so beautifully. Love this post. Great review and I like that you analyze the ingredients in depth so we know what is good. But Bioderma micellar water is my favorite holy grail makeup remover. I do try others but this has to be with me always. Loreal and Simple and Garnier are the other that are good as well. I hate it when they sting-what is the point then? How exactly is the product supposed to be easy to use? Ugh. 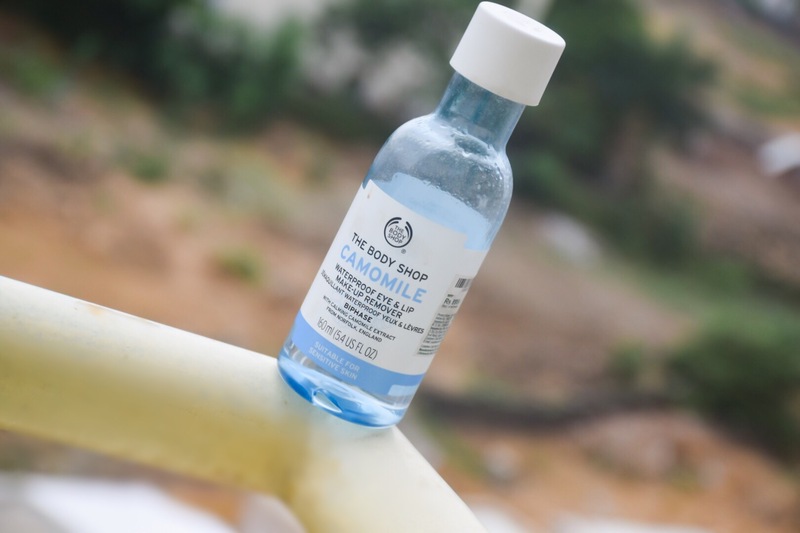 I stick to my Johnson’s baby oil for my eye area, it removes even the most stubborn waterproof mascaras, eyeliners and liquid lipsticks. Wow! I’m so glad you mentioned the ingredients. Often, when I think of the Body Shop, I think they have fairly healthy ingredients but now I am starting to rethink that.